“Big Hero 6” takes place in a fictional amalgamation of San Francisco and Tokyo appropriately called San Fransokyo. Our young hero is appropriate named Hiro (Ryan Potter) who is a some sort of robotics genius 14 year-old who takes part in back alley robotics fights. He’s urged by his older brother Tadashi (Daniel Henney) to apply to the robotics program at his college. He invents these amazing microbots that he can control and morph into various objects and shapes with his mind, which obviously attracts lots of attention, but before you can say “every Disney movie needs a tragic family death” something traumatic happens in which the only thing left behind is a lovable, medical robot named Baymax (Scott Adsit) made by Tadashi. Baymax, who senses that Hiro is hurting emotionally is activated and becomes his personal healthcare companion. Baymax is simply one of the most amazing animated characters in quite some time. Together, Baymax and Hiro form a typical bond found in movies like this (think “E.T.” or “How toTrain Your Dragon”) and eventually happen upon something quite sinister lurking in San Fransokyo. The film is actually based on a little known Marvel comic book series. Having little knowledge of the comic, it can be said that the film at least is quite a success. The rich characterizations are quite something. Hiro doesn’t just feel like any kid who has experienced loss. And the bond between him and Baymax is simply a pleasure to watch. It’s funny and everything about these two feel genuine. Nothing here feels forced. Eventually Hiro and Baymax form a super hero team with his nerdy college-aged friends who are all super geniuses too. The group is diverse and every character feels memorable and is given something to do and there’s even a memorable villain on top of everything else. Don Hall and Christ Williams have taken an almost worn out genre and crafted a really great film that could easily become its own franchise with plenty of good characters to go around. 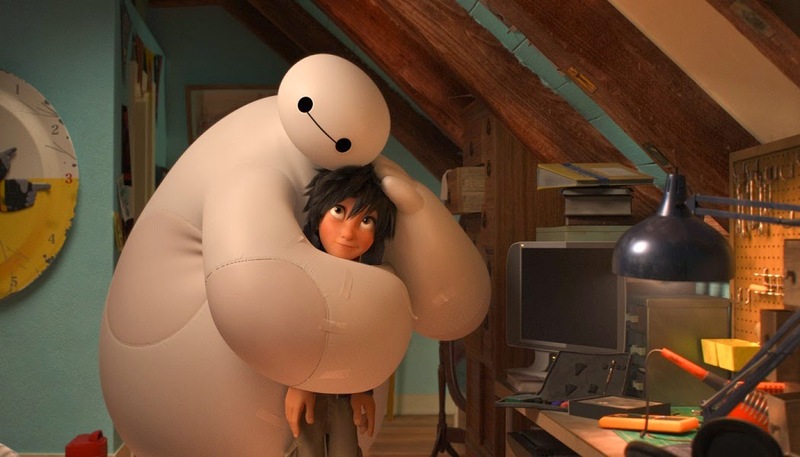 Feature Trailer for Big Hero 6 on TrailerAddict.